Spoiler Season is in full swing, readers, and we've been shown so much in just one day. No time for chatter; let's take a look. Quick upkeep, a note on returning mechanics. Raid can be still appearing on the pirates intent on gaining value from attacking; this one being a 3/3 for 3 in Limited feels good as a 23rd card, and playable in an aggressive Red deck. Dinosaurs are no less angry having found Orazca, and the Enrage trigger is shown off on a dinosaur that looks just like the one that killed Wayne Knight's character from Jurassic Park with it's deadly spittle. I'm surprised to, not only see Explore return, but also in such an interesting new design space. 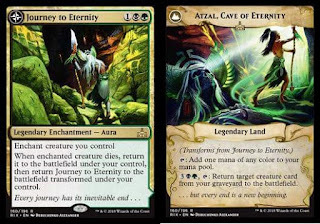 By putting it on a targeted sorcery means you either give whichever creature you want a pump spell, or effectively paying one Green for a free land, and the ability to play it so you don't lose tempo. This change of pace for Explore reminds me of Pride Sovereign or Angel of Condemnation, putting Exert in a new but measured slant, much in the same way Explore has been re-imagined here. A quick meander down the river Kumena, and you'll find the Herald of the choppy, rough waters of the river itself. Kumena appears to have installed himself as the ruler of the Golden City, and the Merfolk all literally bow to him. His three activated abilities scale up in power based on how many Merfolk you tap to activate it. I don't see how useful having a 2/4 go Unblocked would be. Tapping three Merfolk to draw a card is reminiscent and strictly better than Crypt Breaker (once premier One-Drop of Standard's best tribal deck). Then tapping five Merfolk for a permanent anthem that is synergistic with Herald of Secret Streams is very powerful, particularly considering that Kumena and H.o.S.S are on curve. 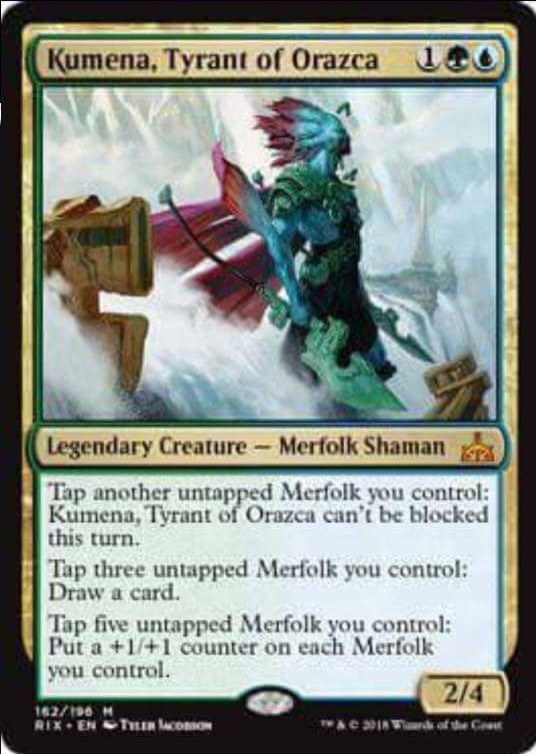 I don't know if Kumena is the Lord Mark Rosewater was teasing, though I do consider him to be a potential engine that can charge up a Merfolk tribal deck - whether it be to buff the team or refill your hand. There is one thing that can help Kumena's playability: how many more effects will there be to make Merfolk tokens? Deeproot Waters is not enough. I know that the FNM promo tokens for Rivals includes the 1/1 Hexproof Merfolk, so the fact it was saved for this season may mean there's more effects that make those tokens. Depending what they are can determine whether Kumena is the engine the deck needs. Otherwise he may be considered too slow for Modern (tapping 5 of your own creatures is near unthinkable in the breakneck speed of Modern), or even still, relegated to Commander brews. It wouldn't be a new Magic set without a weird Red Enchantment. Here's Rivals'. Effectively on your Upkeep, you, the player, fight a creature. Never dipping below 15 life feels and having repeatable removal feels very powerful. I just wonder if it'll see any play like any of the other weird Red Enchantments of Magic's history. 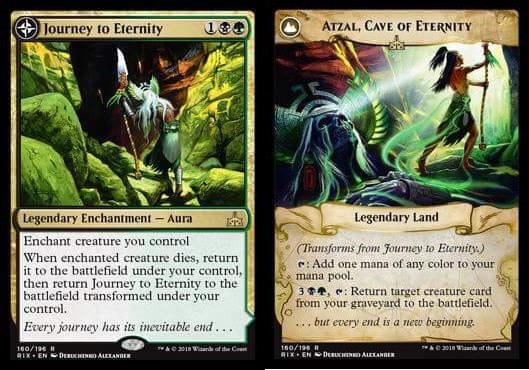 Seems like the legendary flip enchantments are in enemy colours, and the Golgari one is here for us to see. The overlap in Black and Green means the graveyard, which is what this one regards. Ensuring one of your creatures comes immediately back after dying provides a form of card advantage often seen in Golgari by means of resilience and persistence. Would the enchantment be better if it buffed the immortal creature? Yes. Does it matter, not really, because it still comes back (just imagine putting it on Thragtusk). The land is also ridiculous. Perfect fixing and the ability to recur any creature at instant speed for 5 mana is gross. Meren players take heed, this is gold! I guess that just about wraps it up. Or it would have if there hadn't been a sight overhead. 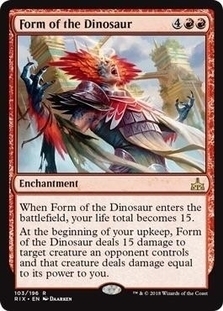 The White Elder Dinosaur is here. Ghalta and Tetzimoc are part of a cycle of immensely splashy Elder Dinosaurs (hopefully) in all five colours. We'll see the rest soon as spoiler season rolls on, but to wrap up, here's an eight mana bowl of keyword soup. 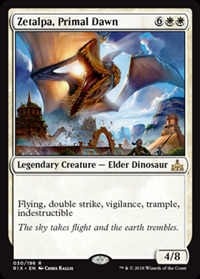 Fly well in Odric, Lunarch Marshal Commander decks, big boy. I hope you could be a good Control finisher post rotation.